We don’t really do tags…buuuut, we were tagged and bribed (with virtual chocolate) by Kelly @ Diva Booknerd to do the Book Blogger Test. And why not?! Kelly is awesome. Books rock. Virtual chocolate for the win. what are your top book pet hates? MIME: Let me get my soapbox! CAIT: Be nice now, Mime. Don’t scare our followers. MIME: Silence in the back row! Thirdly, characters and food. Characters who don’t eat because they’re nervous or upset, and they don’t have blood sugar dumps later. And characters who eat ice cream and takeout all the time and never get fat. CAIT: In the middle of an ice creamery that is entirely empty of people and all the ice cream is free. Just for me. And Cait and the Book lived happily ever after. MIME: You may not know this, but that’s also Cait’s version of heaven. CAIT: What is this? The Spanish Inquisition? I AM NOT CONFESSING TO ANYTHING. I AM NOT GUILTY. 1. I’ve never read Harry Potter. CAIT: Wow. Someone is on the naughty list. 1. I judge books by their covers. 2. I cut up books and turn them into art and I feel this is a horrific taboo. 3. I never read past my bedtime. CAIT: Question. Am I subtly “other people”? MIME: No dear, of course not. CAIT: Well, I, as wonderful as I am, have cried in a few books. I cried in The Perks of Being A Wallflower. (Can’t remember why.) And then I cried in despair during The Bone Season because I didn’t think it’d ever finish. what is your favourite snack while reading? CAIT: The real question is: What ISN’T my favourite snack while reading. MIME: Brussel sprout. I don’t think you eat them. Period. CAIT: They’re not real food. MIME: Me, I would have to say chocolate. I sound pretty obsessed, don’t I? MIME: How To Read For Dummies? CAIT: Keep calm there, dummy. I will recommend REAL books. show us a picture of your bookshelf? CAIT: This is my bookshelf and mine alone. Mime doesn’t care and covet and hoard books like I do. CAIT: See? Again with the food. We’re pretty extra sure we’ve mentioned food in EVERY SINGLE ANSWER to these questions. MIME: If I told you, then it wouldn’t be a secret, would it? Seriously? Are we playing Truth or Dare or something? CAIT: When I borrowed Twilight from the library, I got Mime to pick it up. You know, so I didn’t look like a fangirling 13-year-old. this is a tag, so feel free to snag the questions for your own blog if you like. but while your here, be brave! tell us YOUR top 3 bookish confessions! Cait and Mime busy planning their 3rd bloggy birthday celebrations (coming later this month) and fangirling over books and singing Frozen in the car. ALL AT ONCE LIKE A BOSS. Mime is recovering from music performances at school. And Cait is pretending to write a blurb for her latest book. So far it reads “There once was a bunch of psychos. They died. The end.” But, yeah, still tweaking. You two are my favourite people in the history of ever. You should make duo blog posts more often 🙂 I think I've said that before but it's true!I LOOOOVE your bookshelf. I remember seeing a photo when it was empty – you've filled it so fast! I have to confess that I don't read past my bedtime either. People often talk about how they stayed up ALL NIGHT finishing a book…yeah, no, never happens to me! (Mime, however, is going to Book Blogger Prison for never having read Harry Potter).Great post as usual 🙂 love all the food references haha. I know! Look at that little shelf growing so much! I still have technically 5 shelves to fill, and then they’re very deep shelves so I can always hid the books I dislike behind the ones I don’t. I’d totally give them away but…argh. Postage is SO expensive. >_< (And I do feel like Not A Real Book Devotee sometimes because I’ve never felt like I wanted to read a book more than I wanted to sleep. My bad.) I WILL LOCK MIME IN BOOK BLOGGER PRISON FOR YOU. LOL God, the gifs. I don't know which one is my favorite! And Cait, your bookshelf is out of control. But at least you know your system. This was an amazing post! Sooo funny! Thanks for visiting my blog! N’aww, glad you liked it! 3) I haven’t been able to bring myself to read a vampire book yet. It’s the teeth I tell you. Popular books CAN rock, but I know why we get wary of them. 😉 Hah! And nooo I’m not going to judge you. I read picture books all the time. Mostly to my 3 year old nephew, but I kind of enjoy them as well. Vampires are kind of…interesting. I’ve only read like 3 books with them. I’d be up for more, though. Juuuust need to find good ones! IT IS SO SAD. *wipes tears* I needs love and attention and I plan to fix it before the end of the year. Oh my goodness! You guys are hilarious!!!!! “And then I cried in despair during The Bone Season because I didn’t think it’d ever finish.” <– This made me laugh so hard!!! LOL I’m working on my tag post now. I thought it would be easy to answer some question but it really isn’t. Gah! I LOVE THIS POST! (I’ve said this to everything I’ve commented and I have no shame). I love everything about this! I LOVE THAT BOOKSHELF! Why is Inkheart so lonely? And woah nice organization skills! JEALOUS. 3. POOP I CAN’T THINK OF ANOTHER. shoot. YOU ARE LIKE THE BEST. THAT IS ALL. Oh gosh…I rate books halfway through reading them too! I’m thinking about my rating from the moment I start! It’s kind of interesting…COULD make an interesting post too. x) I’ve read 81 books this. year. alone. At least you’re not wearing out your eyes, though, right?! THAT BOOKSHELF IS FANTASTIC. I WISH I HAD THAT MUCH SHELF SPACE. 1. Whenever I go to the library I experience the bookish equivalent of “my eyes were bigger than my stomach” because I get SO MANY BOOKS and then don’t have time to read them all. 3. I don’t really use bookmarks. I have been known to lay the book open, upside-down, which apparently breaks the spine. Oops. Do it! Do it! I want to have my whoooole walls lined with bookshelves. I do. My parents aren’t approving, but hey. I NEED that many books in my life. *whispers* Sometimes I break my rule of book before movie, too. I did with The Book Thief and City of Bones. >.< I feel guilty, buuut… I’ll survive. I am also TERRIBLY guilty of #1. My TBR from the library is always quite daunting. You both never fail to make your readers laugh! HAHA! Cait, you cut books?????! Picture please??? I am really curious. Heeey! That’s a good idea actually! I will put a post-about-cutting-up-books on the to-post-about list. YOU’RE A GENIUS. Your bookshelf photo is the best. I’m quite fond of it. I love my bookshelf. I sometimes stare at it and think happy thoughts. Oh you should definitely do that! I love seeing other people’s shelves too! 1. I’ve never read Twilight or Harry Potter either. 2. I have yet to finish Lord of the Rings. 3. I still haven’t unpacked of all my books from when we moved, so the poor darlings are still stuffed in a box. Hahaha great answers ladies! Food is definitely the answer to most things. Cait’s bookshelf is actually a lot more organized than mine. The lonely shelf of sadness actually made me LOL. Too funny. I, much alike Mime, have no soul. Lol I can cry so hard at Marley & Me, the movie. The book? Didn’t shed a single tear. Same goes for Perks of Being a Wallflower. …I also never cried reading the Fault in Our Stars. The movie will definitely make me a hot mess though. Regarding cutting books and turning them into art.. OMG I DO THE SAME. I feel so guilty while doing it but afterwards it can look so pretty c: Have you seen the picture of the Harry Potter book art proposal on tumblr? Somebody cut a out the pages till you could see ‘the unbreakable vow’ chapter heading and put a ring there. SO CUTE. I can cry at books, but I do cry more easily at movies now. I read TFIOS and didn’t cry once, saw the trailer and I literally had tears in my eyes. Im not sure why that is. We Were Liars is the last book that made me cry, it really shocked me and I was definitely not expecting to cry at that book. THAT’S IT. I need to come to your house and cook you REAL Brussel Sprouts fried in LARD. You will be converted. Loved the interaction between you two! You make me laugh. I love that one of your pet hates is one of mine – people who judge before reading the book. Okay, so it may have led me to reading a lot of books I don’t enjoy, at least I feel like I can judge for myself if I like it or if it was as I thought before beginning. And your bookshelves are gorgeous – except for the poor little broken computer! Have I ever told you how much I love you guys? No? Well, I LOVE YOU GUYS. Like a lot.Bookish confessions, eh? Here are some of mine:1) I think I like e-books better than paper books. The horror, I know. I used to be a strict "real" books only kind of reader, but I was won over by the fact that I can read e-books in the dark. And change the book's fonts. And not have to carry around books as gigantic as the Earth when I want to re-read Harry Potter and the Goblet of Fire.2) I didn't like Perks of Being a Wallflower and Looking For Alaska. *hides*3) I don't like buying books very much. What if I end up disliking them or end up never reading them again, ever? I like borrowing books much better, and will only buy a book if I've already read it and loved it. I LOVE that you used a Sword in the Stone gif, that is such a good movie. And I had a little giggle at the Shelf of Sadness, poor little shelf! Oh I cannot say how much I love the picture of your bookshelf! 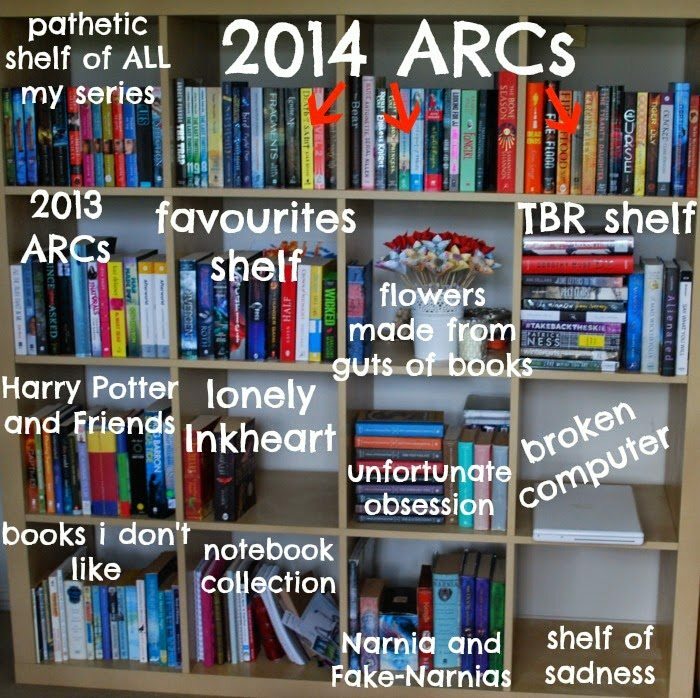 Poor Lonely Inkheart (have you read all the books, since there are only two there?) and Shelf of Sadness. HOW CAN ONE POSSIBLY HAVE AN EMPTY SHELF ON THEIR BOOKSHELF, especially when they’re an avid reader like you, though, Cait? How is that even possible? I title it the “Mystery of the Empty Shelf”.